In the media industry who plays an important role ? or let me put it like this ,who is the face of any T.V. channel ? The answer is simple , who we see on screen talking about the issues,current affairs,mishaps,entertainment business, money business like stock market,culture or any given topic which they like to talk about or say they make viewers aware of what is happening around the world.a man on screen with this kind of responsinilty should be the man with charm,wit ,emotions,knowladge,experience and etiquettes. 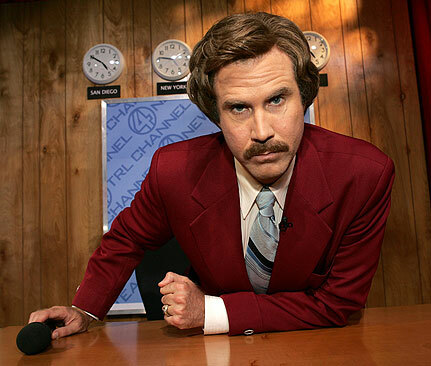 We call this guy an Anchorman. no not the kind of guy on ship with the anchor.this man stays on television and is the face of any T.V. channel.he is the first human contact on screen on whom the reputation of T.V. channels lies.This guy takes care of everything on screen.give him anything he does it with utmost perfection.he is the man who defines that what kind of T.V. channel he is working for or in other words what kind of reputation the T.V. channel has in the market.that’s why T.V. channels are always on the hunt for a personality like this. 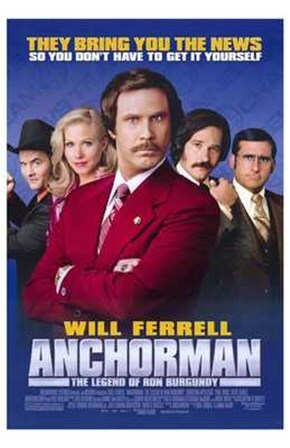 Anchorman ,our very own Will Ferrell fits the bill when it comes to define creativity with professionalism.he is one man who played the role of an anchorman in 2004 hit ‘Anchorman: The Legend of Ron Burgundy’ directed by Adam Mckay.the film was written by Ferrell and Mckay both.at the time of its released it was said that fillm is only intended to create humor and should not be taken at its face value ,this film is not here to offence anyone but to create wits and humor.stationed in San Diego T.V. channel the film talks about Ferrell who clashes with his new female counterpart.film of this nature got its due when it got fetaured in Bravo’s 100 funniest movies of all time at number 100 and ranked 113 on Empire’s 500 greatest movies of all time.the film grossed $28.4 million in its opening weekend and made $90.6 million worldwide. The amount of money it grossed during its run you can easily get an idea about Will Ferrell title character of an Anchorman.we have seen him in Old School,ELF,Talladega Nights,Stranger than fiction,Blades of glory ,Semi-pro and The other guys.he is the member of the Frat Pack ,a generation of leading actors who emerged during 1990s and 2000s in hollywood comedy films which did good business all around.these names include Jack Black,Ben Stiller,Steve Carell,Vince Vaughn and brother duo Owen and Luke Wilson. Will Ferrell our California guy is very talented and there is no question about his skills which he use to make people laugh on screen.that’s why Adam Mckay is coming with sequel of Anchorman title as Anchorman 2.after many years ,many meetings,appointments,salary compromises Anchorman 2 is finally in the process of becoming a reality.this film is a major production in terms of reliving the magic of Anchorman as it happened in 2004.its still in the process of making and sooner or later in the year 2013 the film will be ready for release but at the moment Will Ferrell and Adam Mckay are still working on the script.Adam Mckay has revealed some interesting details about Anchorman 2 in his latest interview. 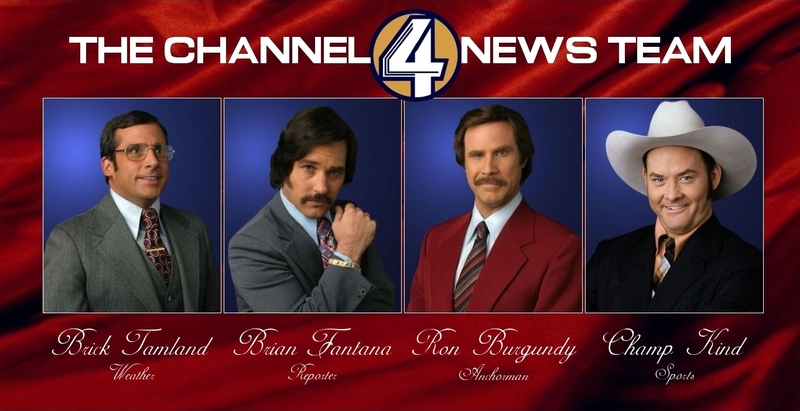 Oh well ,now since Adam is talking about change this time ,so we can all expect some more laugh and more wits in Anchorman 2 by Ron Burgandy.we all know what had happened last time when Ron Burgandy aka Will Ferrell and Channel 4 evening news team encountered change.so we just can’t wait to see what kind of changes they faces this time or say what kind of changes Will Ferrell and Adam Mckay come up with this time. And yes not to forget the star cast from the first movie ,they all played important part in making this movie one of a kind comedy in its genre.so Adam Mckay has not forget to re cast Paul Rudd, Steve Carell,David Koechner and Vince Vaughn.they are all in.what about Christina Applegate’s Veronica Corningstone? Mckay has a different take on this ,he admits she’s expendable ,much like the women in Austin Powers franchise.but hang on he has something to say on it. So in the nuttshell we can see that the first film did quite a good job in comedy genre in its time and sets a benchmark , a standard in comedy films.we have lots of expectation from Adam Mckay and Will Ferrell’s upcoming sequel of Anchorman as Anchorman 2 which is due to release in 2013.well ,we can’t wait to see what our favourite Anchorman do this time ,after all he is the best media guy around who even today makes us laugh in times of not so funny comedy films.but Anchorman 2 will surely be a breadth of fresh air. I actually love Will Ferrell. Have you seen him in “Stranger than Fiction”? A must-watch! He is a totally different character in that one.